Co-author Doug Emlen is interviewed by Nature about creating an ebook version of Evolution. 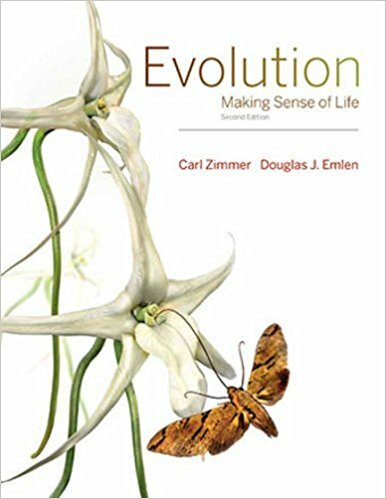 In 2011, science writer Carl Zimmer and evolutionary biologist Douglas Emlen teamed up to write a textbook intended for biology majors that would inspire students while delivering a solid foundation in evolutionary biology. Now they’ve updated the second edition of Evolution: Making Sense of Life with accounts of the latest scientific research, new illustrations, and an entirely new chapter on human evolution. Students will learn the fundamental concepts of evolutionary theory, such as natural selection, genetic drift, phylogeny, and coevolution. Evolution: Making Sense of Life also drives home the relevance of evolution for disciplines ranging from conservation biology to medicine. With riveting stories about evolutionary biologists at work everywhere from the Arctic to tropical rain forests to hospital wards, the book is a reading adventure designed to grab the imagination of the students, showing them exactly why it is that evolution makes such brilliant sense of life. Evolution: Making Sense of Life is accompanied by instructor resources such as test banks, lecture slides, and a study guide. If you teach an evolution class you can request a free exam copy here. Exciting is a word not often used to describe a new textbook. But by using powerful examples, beautiful images, and finely wrought prose, Zimmer and Emlen have produced a book that not only conveys the explanatory power of evolution, but is also permeated with the joy of doing science. Their text can only be described as an exciting moment for our field: it is an important accomplishment for our students and for evolutionary biology at large. A richly illustrated and very clearly written text, Evolution: Making Sense of Life brings forth the excitement, power, and importance of modern evolutionary biology in an accessible, yet sophisticated overview of the field. Two master craftsmen in the art of scientific communication have combined to produce an excellent basic text on Evolution: it informs, explains, teaches, and inspires. The illustrations are outstanding. Carl Zimmer and Douglas Emlen have captured in this stunning new book the excitement and richness of twenty-first-century evolutionary biology. They describe clearly and elegantly not only what, but also how, we are learning about evolutionary processes and the patterns they produce. The writing is compelling, the illustrations beautiful and truly informative, and the balance between breadth and depth of discussion on each topic just right. This is a book that would make anyone think about becoming an evolutionary biologist, today. This is not your grandmother’s evolution text. Breathtakingly illustrated, this book covers not only the usual topics in evolution—adaptation, drift, phylogenetic analysis—but also a host of new and exciting areas where groundbreaking research is occurring. It also shows how evolutionary biology is done, with glimpses of the real people behind the discoveries. Beautifully written and lavishly illustrated, here’s a superb textbook that can do double duty gracing the coffee table. This book is bound to attract many more students into the field of evolutionary biology. I think my students will be genuinely more at ease with their reading assignments and more able to assimilate and retain information from this text. The authors use their expert narrative skills to focus on the big conceptual ideas, which is what matters most in my students’ long-term education. Evolution: Making Sense of Life provides a comprehensive and compelling overview of the field of evolutionary biology. The text contains beautiful illustrations and up-to-date examples from recent research articles. The depth and breadth of the material, ranging from bacteria to humans, will be of interest to students, faculty, and the general public alike.